For many institutions, hard floors are their only option, and for this, there are many types. Although they are all highly durable, some come with protective coatings which over time get scuffed or scratched from the high amounts of foot traffic they encounter. 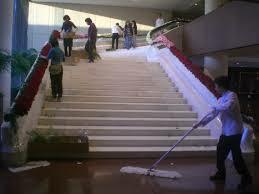 Once floors reach this stage, it is not a job for a normal person, a scrubbing machine used on the wrong floor type can damage it beyond repair. Not only this, waxing a floor is not as easy as it sounds, a wax on the wrong floor type is an accident waiting to happen. It goes to show, it pays to call in the professionals at times like this, and there is none better than the professional staff at SBS. They have spent numerous years learning all about the different type of hard flooring, and how they can be cleaned with the best green cleaning chemicals. Free Demonstration of Hard Floor Care. The choice of using professionals for this service also adds an element of professionalism to your building as flooring is one of the main focal points when anyone enters your building. When maintaining floors to this standard, there are also cost savings to be made, cleaning chemical costs can be reduced and only a mild detergent and a mop/ machine cleaner is required to keep your floor looking its best for longer. No matter how large or small your hard flooring, SBS can advise you on your next step, the last thing we want you to do is to pay for a service which you do not necessarily need. For further information on our specialist cleaning services including Office Cleaning, Retail Cleaning, Commercial Cleaning, Restaurant Cleaning, Industrial Cleaning, Green Cleaning, Construction Cleaning, Carpet Cleaning, Carpet Care, Floor Care and Window Cleaning Services in Edmonton AB.